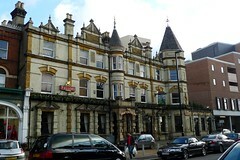 A very large Fuller's pub just by West Ealing Station. Just on the ground floor there are at least two separate rooms for drinking alone. One side is more sparsely furnished, bare floors and includes a pool table, while the other is a little cosier, with some carpeting, tables on a raised area, and a outdoor terrace drinking area. There's also a separate dining room, and further function rooms available upstairs. Despite its size, it still manages to feel quite cosy and welcoming, helped by the friendly service behind the bar. When secretlondon visited in 2016 I didn't see a pool table (although I didn't look) but there was a pinball table. Whatpub says it was refurbished in Spring 2016. When Ewan visited in 2009 there were four handpulls on one side and three on the other, serving the usual Fuller's ales (London Pride, ESB, Chiswick) as well as Gale's Seafarers Ale. In winter, mulled wine is available for £3/glass, and there's also a range of draught taps for lagers. When secretlondon visited in October 2016 there were still four handpulls and 10 keg taps (other side not checked). My half of Fuller's/Yeastie Boys Double Summer keg beer was £2.25. The beer on cask was about £4/pint. Food is served noon-9pm Mondays and Tuesdays, noon-10pm Wednesdays through Saturdays, and noon-8pm Sundays photo of menu in December 2009. On his December 2009 visit, Ewan tried a fish pie (£9.50) photo, which though pricy was very large indeed and had a decent amount of various seafood in it, though it could have used a bit more. However, again, service was very friendly and plates were cleared promptly. On secretlondon's visit there was football on large TV screens but it was pretty unobtrusive. There is hotel accommodation on site and it is claimed that Vietnamese communist Ho Chi Minh worked here in the kitchens when he lived in the area. Accessibility: 2 steps to enter and 2 more for the ladies toilet (none for the gents). Last visited by secretlondon, October 2016. Opening hours and food times taken from website, January 2010. Last edited 2016-10-23 20:41:25 (version 6; diff). List all versions. Page last edited 2016-10-23 20:41:25 (version 6).